Though marijuana (cannabis sativa) is banned by the World Anti-Doping Agency (WADA), the United States Anti-Doping Agency (USADA) and the NCAA, its increasing legality has many wondering whether using marijuana will help or hinder our quests for optimum athletic performance and fat loss. Do THC, CBD, or other ingredients in marijuana enhance athletic performance on a molecular level? In this article, Ben Greenfield and GreenfieldFitnessSystems author Alyssa Siefert (a PhD in Biomedical Engineering) attempt to answer this question. A few notes before we dive into the science – because only a few double-blind placebo-controlled human studies exist (the classification of cannabis as a Schedule 1 Drug by the DEA inhibits academic research), many of the purported effects of marijuana are extrapolated from rodent studies. The EndoCannabiniod System is very complex and can have links to fitness and wellness. THC and CBD help to regulate your body and protect from cell damage. Cannabis is a cure. So because there are significant differences between the endocannabinoid systems of rodents and humans (science geek-speak for “mice are not men”), certain findings from science are tough to extrapolate to actual people; you’ll notice, as you read, that in many cases the science you read about elsewhere simply does not apply to humans. Also, as you read, it is important to remember that cannabis exerts different effects depending on dose, gender, acute versus chronic use, and route of administration (smoking vs edibles vs. ingesting). Here in the USA, legislation defines marijuana as all parts of the cannabis sativa plant, which contains over 700 chemical compounds. The primary active ingredients are cannabinoids, including THC, which is responsible for psychoactive effects and is the most studied. Peak blood concentrations of cannabinoids occur in 3-8 minutes after you inhale, as opposed to 60-90 minutes after you eat a weed- or oil-containing edible, with neural effects beginning after 20 minutes and maximizing within a range of 2-4 hours. Cannabinoids bind cannabinoid receptors (easy to remember, eh?) on neurons and peripheral cells, receptors which are normally engaged by natural endogenous substances (called endocannabinoids) that your body already makes, but that also can be bound by substances from exogenous (outside) sources. 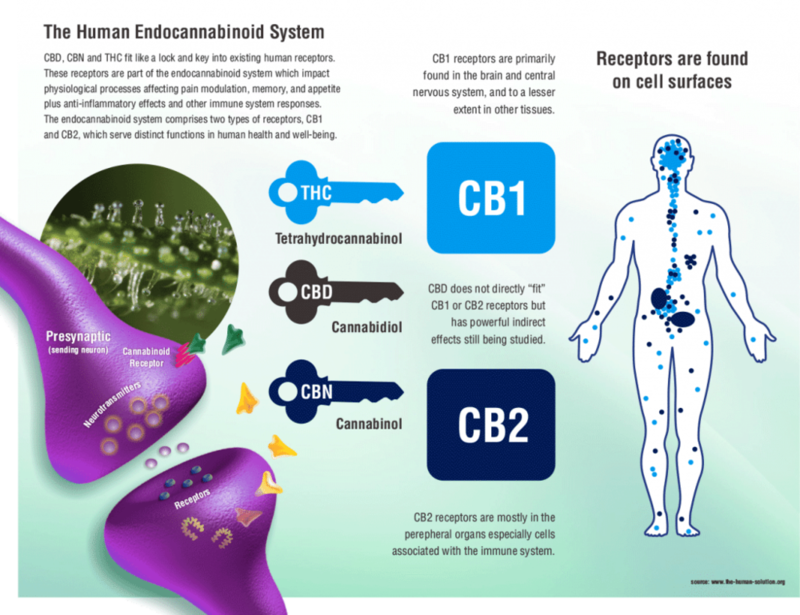 THC binds cannabinoid receptor 1 (CB1), mainly localized in the brain, while cannabinol (CBN) binds CB2, which exists mainly on immune cells. CBD binds neither receptor, but still affects numerous metabolic processes including appetite, pain sensation, immune function, stress reactivity, hormonal secretions, and muscle and fat tissue signaling. The image below does a pretty good job visualizing this for you, and explaining the lock and key mechanism of receptors and substances that bind to those receptors.